Here’s the last episode I have of the unusual CBS documentary series, “The People Act”. Using then-new portable tape recording technology, the series looks at efforts for cultural understanding in small communities around the US. 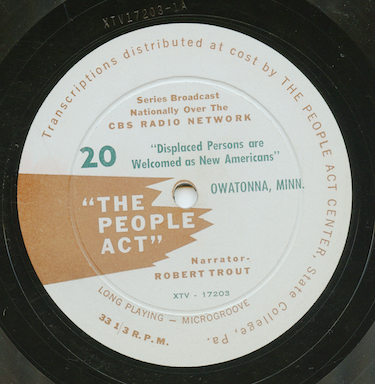 Program 20 in the series, originally heard May 18, 1952, is titled “Displaced Persons Are Welcomed As New Americans”. Robert Trout narrates as the people of Owatonna, Minnesota welcome European refugees to their local community. The program was digitized from an original 12” microgroove lp issued by the People Act Center in State College, Pennsylvania. It was pressed by Columbia and XTY-17203 is the matrix number.